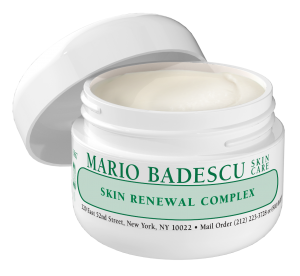 WHY: An anti-aging cream formulated to help improve skin’s texture and soften the look of fine lines, wrinkles, and minor discoloration, our Skin Renewal Complex does exactly what its name suggests: revitalize and renew the complexion. Alpha Hydroxy Acids found naturally in Papaya Extract help smooth rough, uneven patches as anti-aging Vitamins A, D, and E help fight free radical damage. Antioxidant-rich Peanut Oil and Honey Extract further nourish and rejuvenate skin, giving drier skin types a revived, healthy glow. HOW: Apply after cleansing and toning, apply the cream all over your face and neck, avoiding the delicate eye area. Perfect for daily use in the morning and/or evening.